With unobstructed views from the balcony of nature only, you get the feeling of being secluded in the Rocky Mountain wilderness, yet are only less than a five minute walk from the many conveniences of modern day living. 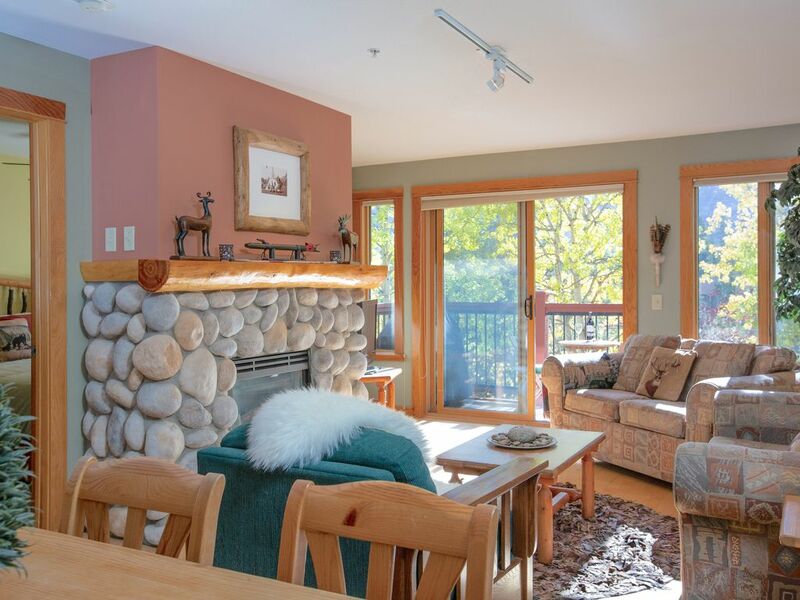 Nestled just 15 minutes outside of Banff in the quaint, cultural alpine town of Canmore, this tastefully decorated 2 bedroom, 2 bath condo features a bright, open living room and dining area boasting hardwood floors, river rock gas fireplace with log mantel, and comfy single sofa beds. 'Mackenzie Mountainside' (900 sq. ft.) has log furniture, rustic leather area rug, Native touches throughout, several heritage photographs by the famous local photographer Byron Harmon placed in rustic log picture frames, and a deck that provides spectacular views of the creek and surrounding peaks, including the famous 'Three Sisters'. With unobstructed views of pretty much nature only, you get the feeling of wilderness seclusion, yet are only a less than five minute walk from conveniences of the quaint, yet cultural alpine town of Canmore. In the living room for your relaxation and entertainment are a 32" flatscreen television/DVD player with basic cable, and CD player. The balcony off of the living room not only provides spectacular creek and mountain views, it also provides two deck chairs, and a large BBQ to fire up that world famous Alberta beef! The fully equipped modern kitchen contains tiled floors, dishwasher, microwave, a refrigerator and cupboards stocked with various condiments, cookbooks, and just about every tool the gourmet chef in you would need to create a fabulous meal. The spacious, yet cozy master bedrooms contains a queen size bed with rustic log headboard and two closets, while the second bedroom contains a queen bed with rustic log headboard and one large closet. Both bedrooms contain quality bed sheets, duvets and pillows, as well as vintage bedroom furniture and 'rustic' decorative lamps. The master en-suite contains a shower stall, while the second bathroom located in the hallway contains a bathtub/shower combination - quality towels provided in each. The hallway contains a built-in bookshelf brimming with various paperback books and hard cover coffee table books, all of which can be enjoyed while taking in the fresh mountain air on the balcony by day, or cozying up next to the warm fire at night. Also provided for your enjoyment with friends and family are various board games and decks of cards. The condo has a large storage room containing a washer and dryer, iron and ironing board, fans, first aid kit, and various cleaning supplies. Also provided for your convenience is a heated underground garage with an assigned parking stall. OWNER'S CANCELLATION POLICY: 25% of the total amount is nonrefundable if there is a cancellation prior to 30 or 45 days (depending on season). The nonrefundable deposit may then be put towards a future stay. If booking is cancelled within the 30 or 45 days, the total amount is non-refundable unless Owner is able to re-book the condo for the dates you had reserved. If able to re-book, you will be refunded a prorated share of each day filled, less a $100 cancellation fee. The bathtub is long and deep. Located at the edge of Main Street, across from Policeman's Creek. Stunning views of the Three Sisters mountains during the times when the trees are dormant. All within a 1-10 minute walk are large grocery stores, liquor stores, drug stores, video rental, wonderful casual and fine dining restaurants, coffee shops, art galleries, antique shops, sports clothing/gear stores and rental, and the historic Royal Canadian Mounted Police barracks. We love city of Canmore and the Canadian Rockies . The creek right by the condominiums is gorges and perfect spot to take a walk and enjoy the beautiful views of Canadian Rockies . As of the condo few pluses and few minuses . Specuse with laundry room and balcony but with limited view on the Rockies dut to the trees partially covering the view . Not so quaiet at night due to the fact the sport bar in the same duilding downstairs with tables outside is a good spot for party up to long night hours which in not a good thing for People which like sleep well with out disruption of drunks .I will recommend this condo for younger generation like to party all night but not so much for people like myself which like to relax without leasing screaming of drunks in this beautiful small town . One good thing we like is walking distance to the small downtown with lovely restaurants and shopping. My son was given his choice of where he wanted to go for his graduation vacation and he picked Banff. I can take the credit of finding this perfect condo located in Canmore, this place was perfect with awesome views and is located in a perfect location, very close to downtown for dining,shopping or just a relaxing beer. It’s just a short drive to Banff and the hiking, lakes in the National Park are something everyone has to see as they are beautiful. Thank You Leanne Mackenzie for letting us rent your beautiful condo. Thank you for the kind review! I'm so happy to know that you enjoyed your stay in my condo, and the gorgeous Canadian Rockies! Yes, the condo is indeed located in a very convenient location in town where you can walk to just about anywhere you need to go, yet with views of pretty much nature only. We loved our stay here! The condo felt so cozy with the fireplace and was just the perfect size and layout. It was nearby everything in Canmore and had a great mountain view. Leanne was immediately accessible and responsive when we had any issues. It was extremely, unseasonably cold when we were staying there so it took an extra day before the radiant in floor heat could catch up to the temperature we set to keep us comfortable but I’m sure this was an unusual situation. The only addition I would have loved to see would be real plants and real candles, but I do understand where these decisions came from. Overall, a wonderful home away from home. Highly recommended. Thank you for your 5 star review. I'm so glad that you enjoyed your stay in my condo. The thermostat should be kept at a comfortable 20C at all times, so I apologize that a previous guest turned it way down prior to your arrival and that it took time for in floor heating to kick in, but glad that the fireplace helped to make it more bearable. My friend and I were looking for a cozy mountain getaway, and we got it! Leanne's condo is perfect: it came with every thing we could have needed for our relaxing vacation in Canmore. We didn't even have to rent a car as it's located right next to the downtown area, the Banff Airporter shuttle takes you from the Calgary airport to a nearby hotel, and the ROAM bus (with service to Banff) has a convenient stop nearby. The views are as fabulous as the photos show. I will definitely be staying here again! Have a very Merry Christmas and Happy 2018! easy access to all the delights Canmore has to offer. Was a great place to stay. Great "home base". We went on a lot of day trips then back to the more quiet Canmore! Wonderful, quaint town. Shopping and restaurants! OWNER'S CANCELLATION POLICY: If you cancel your reservation outside 30 or 45 days (depending on season), you will be refunded 75% of your full payment. 25% is nonrefundable and may be put towards a future stay. If you cancel within the 30 or 45 days prior to your dates, the payment is non-refundable unless the Owner is able to re-book the condo for the dates you had reserved. If able to re-book, you will be refunded a prorated share of each day filled, less a $100 cancellation fee. PET POLICY: Cats are not allowed. 1 medium to large dog only, and 2 small dogs okay as long as they do NOT bark excessively and stay off all of the furniture. (If they tend to sit on the furniture or sleep on the bed with you, please bring your own sheets or blankets for it to lay on - do not use the condo blankets.) Owner has final say whether or not the dog may be permitted to stay. RENTAL AGREEMENT AND WAIVER: Soon after the instant booking reservation has been made, Owner will e-mail a confirmation letter with further details and instructions regarding your reservation. A Rental Agreement and Waiver will then be sent approximately 2 months prior to the stay that requires a signature, home address, as well as credit card information to protect Owner for potential theft, major damages, or extra special cleaning required after Guest's check-out. (Owner has charged a Guest's credit card only once in 16 years (for extra special cleaning)).